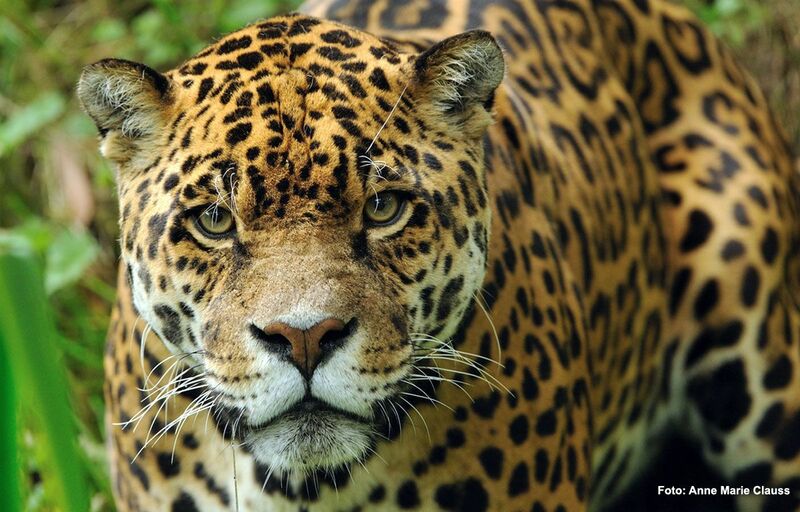 All about the Jaguar - Panthera onca. Yaguareté, or “True Fiera” in Guarani language, Jaguar for the new world, king of tropical and subtropical forests of America, is the largest felid of the continent and the third in the world. Great swimmer, indefatigable walker and powerful hunter, it can travel great distances in a single day, and even the rivers Iguazú, Paraná or Bermejo can cut him off. Its adaptability enables him to live both in the thickest jungle and open savannas, flooded areas and even desert. While prefers large prey such as peccaries, young tapirs and corzuelas, also eats lizards, alligators and snakes, small rodents and even small birds, catching animals purely arboreal like monkeys, fishing in rivers and streams and sometimes eat some fruit. Frequents all environments that are submitted, closed forests, Tacuarales, chopped, roads and even uses industrial plantations of pine and other exotic species to move. Like the proximity of water, so it tends to find it on river shores, estuaries and/or wetlands, however, their immense adaptability allowed to live in as dry and inhospitable places like the dry Chaco, where water is most scarce and in many areas, virtually nonexistent. The jaguar is a solitary dweller. There are insufficient data to determine the size of its territory and a difference between different types of environments is observed. This is also related to the availability of prey that exists; in areas where hunting is less abundant, its territories become broader, which is why in places where man actively hunting, Tiger Criollo must travel more to get their food. It’s lonely, each male establishes its territory by expelling the others, but it shares with several females, with which it is paired. Individuals of both sexes come together for shorter or longer periods only during the time I was zeal. It signals its territory by roars and also does it with excrement or scratching the trunks of trees. The young specimens, recently emancipated youth care of his mother and old, driven from their territories by stronger youth, must move into new areas where they can be established. This is probably the reason that older animals have been found in places far from their normal area, even in areas very close to humans. Unfortunately, the continued reduction of their habitat by clearing and processing for agriculture and/or livestock, represents a high risk for these copies, which usually end their days to meet with the man. It can be active throughout the day, although it is often in the hottest hours of rest. In areas where human presence (and thus the threat of being caught) is more intense, their nocturnal activity tends to increase. Although the jaguar is an animal that by its very strength and power is potentially dangerous to humans, the few documented cases of attacks on humans are treated mostly corralled animals, seeking more defend his own life to seek the death of his hunter or female defending her cubs.